Although the black and white First Edition is sold out, pre-order the sepia-toned Vitruvian Edition anytime between now and March 20, 2019. Click on the below for more info. 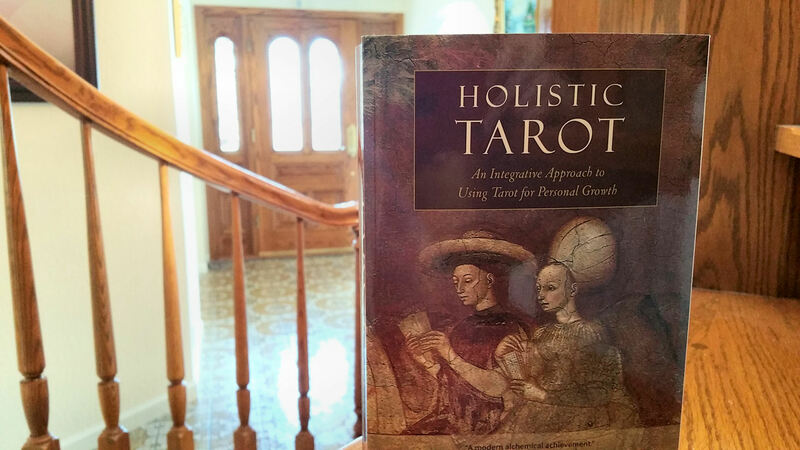 After Holistic Tarot was released in 2015 and I became a tarot author, I often got asked whether I had any plans for publishing a tarot deck. I cannot recall if I ever explicitly said no, but I am sure that I responded in ways that suggested a no. That’s because I wasn’t certain I had anything meaningful to contribute to the world of tarot decks. I wasn’t interested in producing a Rider-Waite-Smith clone or a Thoth derivative, and also wasn’t interested in devising an entirely new tarot system. And then anything in between those polar extremes felt like it would require a level of artful execution that I did not believe myself to be capable of. Reality didn’t mirror the fantastical tweet. I didn’t go that crazy with the crafting process. But this is how it all started. Me running my mouth (or pecking my fingertips away) on Twitter without any careful thought. Then in the summer of 2018, a fancy idea sprung into my mind on a whim: what if I drew my own tarot deck, entirely by hand, cut out each card manually, and produced a single-copy original set of cards for my personal reading use? Each originally-drawn card would in effect be a sigil, I fantasized. And the entire process would be a religious ritual. When I approached the concept of creating a tarot deck as intended entirely for myself only, never to be shared with the public, all inhibitions disappeared. That’s how I got the courage to undertake such a project. Within the night, I assembled the materials I would need and got to work, beginning with Key 0 and going in numerological order through the Keys of the Major Arcana. I did not intentionally time my thoughts to the new moon in Gemini. That’s just how it happened. I completed the First Septenary, ending with Key 7: The Chariot on the day of the summer solstice. When I completed the Second Septenary of the Major Arcana, my Holy Guardian Angel was revealed to me, and then I saw that Her presence had been with me all along the journey, shrouded in omens I wasn’t paying close enough attention to. 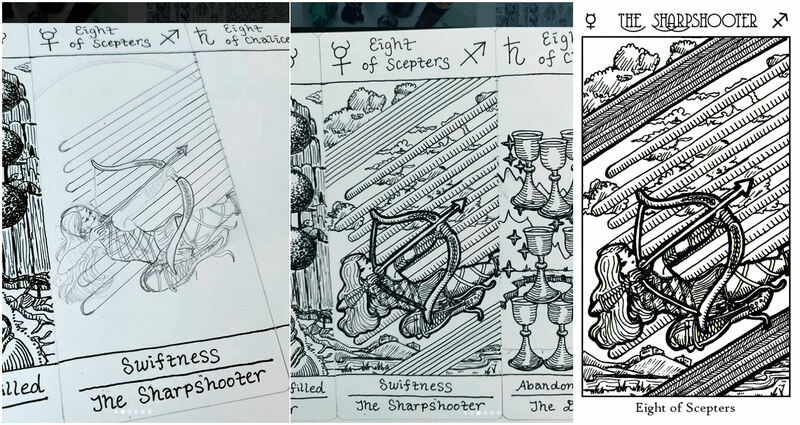 In about seventeen days, exactly on a full moon in Capricorn, I completed line drawings of the Major Arcana. After completing Key 21: The World, I looked back on The Fool card I had drawn back in the beginning and was dissatisfied, so I re-drew The Fool, which I had renamed The Initiate. Thus, for the Majors, I began with Key 0 and yet also ended with Key 0. I then released freely to the public the black and white line drawings of the Major Arcana cards and a companion workbook I had written on ritual coloring of the cards to reveal each one’s own Holy Guardian Angel. Meanwhile I got to work on the Minor Arcana, beginning with the seven lower realms, so that meant starting with the set of Fours in the pips, then Fives, up to the Tens. After the Tens, I commenced the seven upper realms, which are the Aces, Twos, and Threes, and the four elemental Courts. 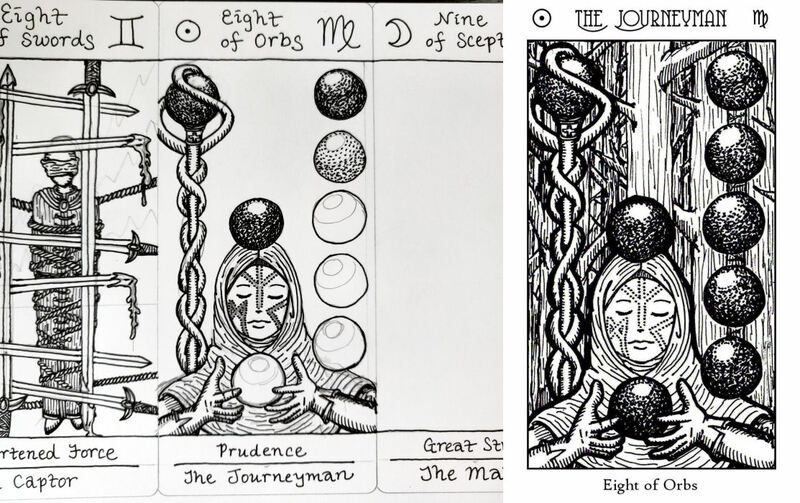 From the first Key 0 I drew to the final card, the King of Pentacles, which I renamed to the Archangel of Mysteries, the pen and ink line drawings took me exactly 38 days. Not only did I finish the line drawings for all 78 cards and a card back design, but I also completed the first draft of The Book of Maps that explains my conception and point of view for each card. I understand that by most standards, that seems very fast, and I have no explanation for how it happened so quickly. I can tell you how I felt. I felt pushed and prodded by the Voice of Spirit, who drove me to keep going, to persist, to be unrelenting, and to stay focused. I devoted every free moment I had to this undertaking. I slept less. I ate less. I eliminated all leisure time from my life. I stopped responding to calls, queries, and personal communications. Working on this deck project took over my life. 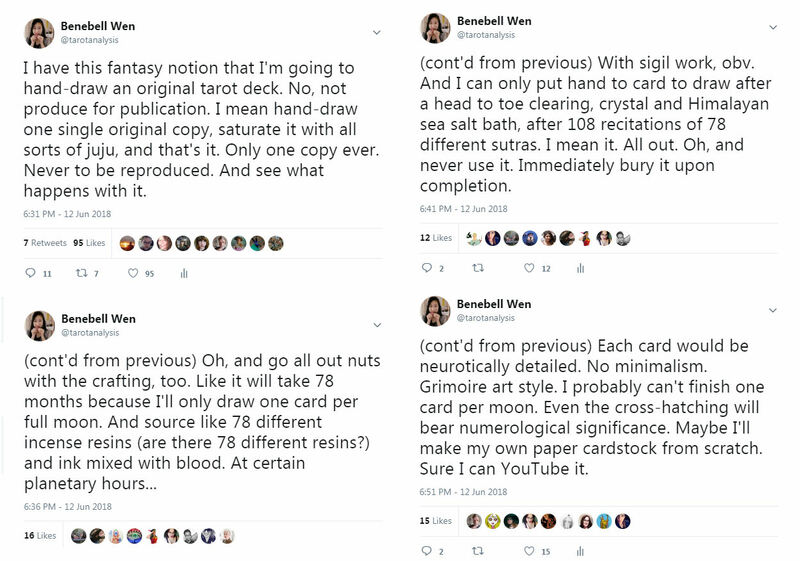 That said, the math is reasonable, and when you consider it, you’ll realize it wasn’t magic: eighty-one hand-drawn works of art (that’s the seventy-eight cards in tarot plus the extra significator cards and a card back design; actually, it was more than that, because I finished many card designs that were later rejected) in thirty-eight days means I had to go at the rate of completing about two to three cards per day. Each card takes me between one to two hours (remember: I’m drawing these cards actual size, where each image is 7 cm x 12 cm, so each original work of art is literally the actual size of a tarot card) so as long as I put in two hours in the morning before work and two hours at night after work every weekday and devoted the entire weekend to this undertaking, finishing all cards of the tarot deck in under two months was manageable. I began the project with the intention of a single-copy tarot deck for my private, personal use only. 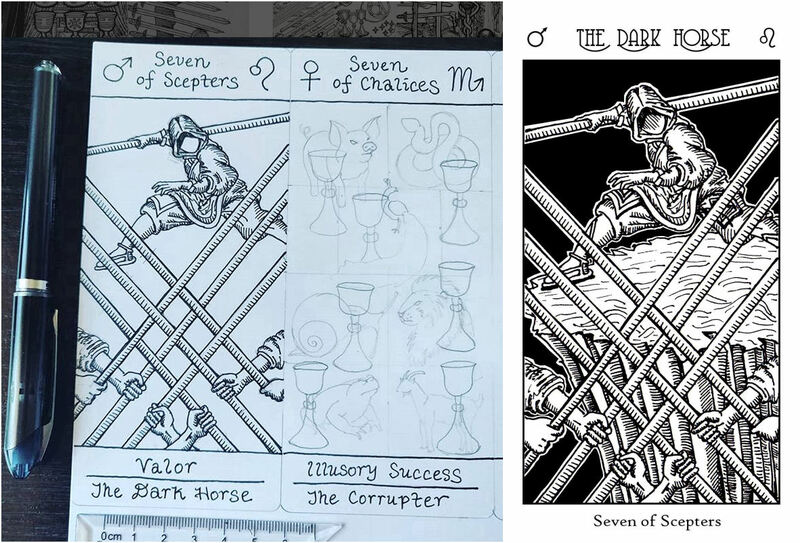 I shared the black and white outlines for the Major Arcana with the public in the event others might find the set of cards meaningful. However, after I finished the project, I changed my mind. Or, dare I say it, the forces around me, both human and otherwise, convinced me to change my mind. I now believe in good faith that I have something meaningful to contribute to the world of tarot decks. Each card’s design represents my personal reconciliation of the Rider-Waite-Smith deck and the Thoth, with the occasional nod to more historic Tarot de Marseille decks. Prior to work on each (and every) card, I would read its entry in Waite’s Pictorial Key and Crowley’s Book of Thoth, then constantly reference Papus, Macgregor Mathers, Ouspensky, and Wynn Wescott. While working on this deck, I was reading the Corpus Hermeticum, The Book of the Cave of Treasures, The Cloud of Unknowing, Albert Mackey’s The Symbolism of Freemasonry, The Chaldean Oracles of Zoroaster, The Oracles of Nostradamus, Kapadia’s The Teachings of Zoroaster, and would always have on hand the Torah, Holy Bible, and Quran, which I read from intermittently. 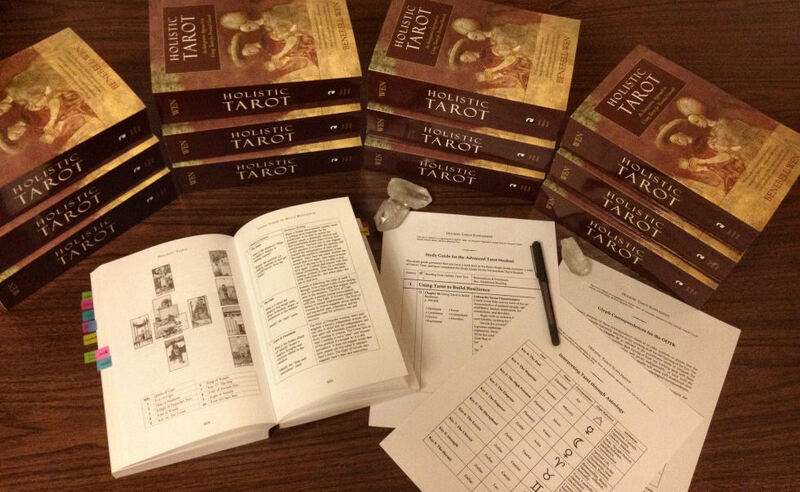 Egyptian, Persian, Gnostic, and Hermetic texts on magic and medieval grimoires from both Europe and the Middle East were consulted during the crafting of Spirit Keeper’s Tarot. I also found myself frequently reciting the Lord’s Prayer while continuing my ordinary routine of the Great Compassion Mantra. Another rejected card back design. Yet I didn’t merely transcribe from those texts onto my tarot cards. I filtered it all through my own perspective, my life, my experiences, and painted those ideas through the colors of my own emotion (despite the cards being in black and white). Thus, the final expression for each card is decidedly my own perspective, reflecting how the realms materialized by the Key energies looked to me in my own mind’s eye. Every single card was an attempt to memorialize in pen and ink the landscapes I traversed through pathworking and depictions of the angelic beings guiding me. In terms of the angelology I’ve based this tarot deck on, the primary angel you as the Keeper of this deck would work with is your Holy Guardian Angel, which in Zoroastrian angelology is referred to as the Arda Fravash, or Fravashis. According to the belief system I’ve built my deck around, each one of us is accompanied by a Holy Guardian Angel who is our guide throughout our lifetime, a beneficent celestial entity that connects us directly to God, or a divine monad. We can invoke our Holy Guardian Angels whenever we are in danger, whether that is danger that threatens us externally, or danger that threatens us from within. There is a vast realm and a hierarchy of angels, or celestial beings on a spiritual plane created by a Supreme Being, which Zoroastrians refer to as Ahura Mazda. These angels are in essence beneficent immortals that are personifications of ideas or key archetypal aspects within our cosmos. The cards are heavily encoded with protection symbols and sigil-crafting to cast a ward around the deck and design its own built-in security defense system. My purpose is to produce a deck system where the collective design taken altogether shields itself from interference by malefic spirit energies of any kind or nature. Furthermore, gatekeepers are employed to patrol the bounds of every threshold for oversight. Though darkness, shadow, revelations of pain, suffering, trauma, and tribulations can come through (and, if we’re being honest and realistic with ourselves, often will), such feeds are always in the beneficent spirit of truth, never malefic. If and when they appear, malefic entities remain at the bounds and the gatekeepers of the deck serve as informants to the tarot reader, transmitting the information needed from or about those malefic entities. Every card is drawn with consecrated ink only. I anointed myself with holy oil prior to working on the cards and I only worked on the cards within closed sanctified sacred space. I began each session of work with prayer and closed with prayer. I constantly stopped to monitor my own frame of mind and my environment to ensure a steady atmosphere of beneficence. I say all that not to convince you or to even presume we share similar spiritual belief systems. I say all that to document the heavy sense of responsibility I felt throughout the crafting of this deck and the measures of faith I took to honor that responsibility. The final result, I hope, is a working tarot deck that will read like a sacred text, one imparting directly to you the Divine Word. It is a book with passages that are ever changing and always tailored to what you need to see, cognizant of the Path you need to take to be resonant with your own highest good. It is a book that reveals the verses of truth and psychic knowledge that will uplift you, empower you, teach you, and change you for the better, in the ways you seek to be changed. When you operate the cards for others, you will be an interpreter of the Divine Word. When the deck is used daily, it becomes a book of common prayer, yielding the insights that will nourish you and those who are your kindred. It is with those intentions ever weighted on my mind that I set out to produce the Spirit Keeper’s Tarot and its companion guidebook, The Book of Maps for you.